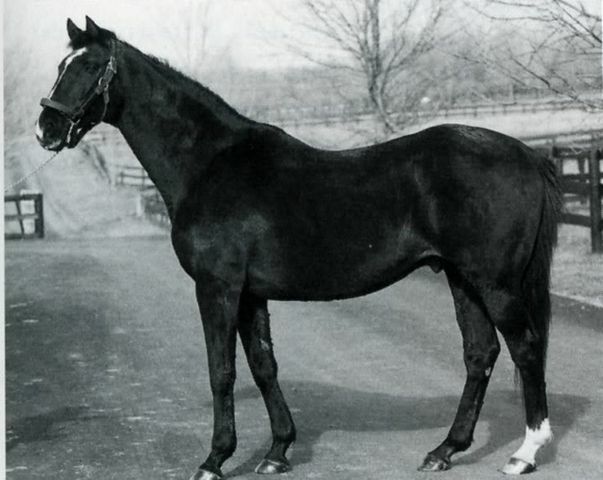 In doing my research on Derby and his identity, I discovered that he was bred by Airdrie Stud, which is owned by consummate horseman (and former Kentucky governor) Brereton C. Jones. Derby romped on some seriously hallowed ground in his early days. Poking around on the Airdrie web site, I found a contact form, and on a whim, sent them a note, not really expecting to hear back, because they’re in the throes of the fall sales, and, well, Airdrie is a big operation. I don’t have rights to this picture of the farm, but this will give you an idea of the kind of place it is. Gorgeous, isn’t it! 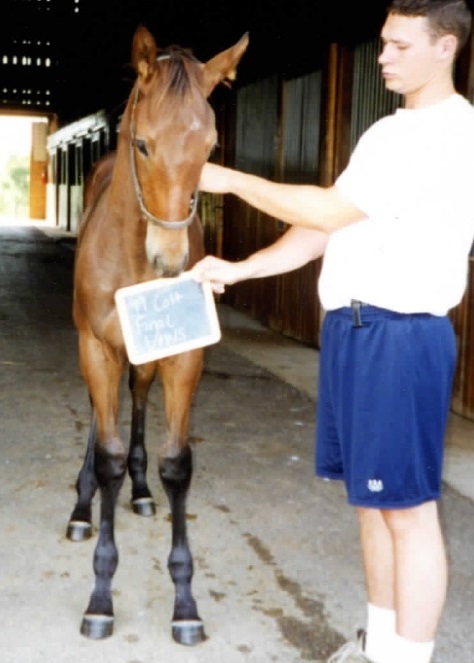 Today, I opened my email and found a message titled “Photo of Derby as a foal” from a woman named Laura, who works at Airdrie. 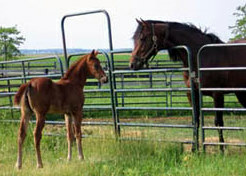 She had trawled Airdrie’s archives, and had found some pictures of Derby as a foal, which she scanned and emailed to me. He was a cute little dickens! Importantly, the photos included an up-close shot if his forehead, and there, wandering toward is left eye, is a distinctive smudge of white hairs. 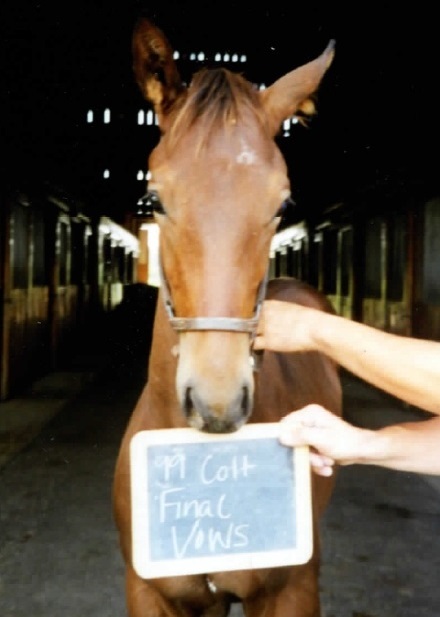 This evidence closes the blooks on Derby’s identification. There were a few little doubts, but I am now 100% sure he is, in fact, Holy Vows. Yep, that is definitely Derby! And dang, he was a cutie. And many thanks again to Laura at Airdrie. A long retired, unsuccessful gelding means nothing to their business, but despite that, Laura tracked down those photos and sent them to me. I’m really grateful. Thank you, Laura! Well, do I have some news for you. We’ve deciphered Derby’s tattoo, and we now know “who” he is — Holy Vows, sired by Holy Bull, out of a mare named Final Vows, by Halo. 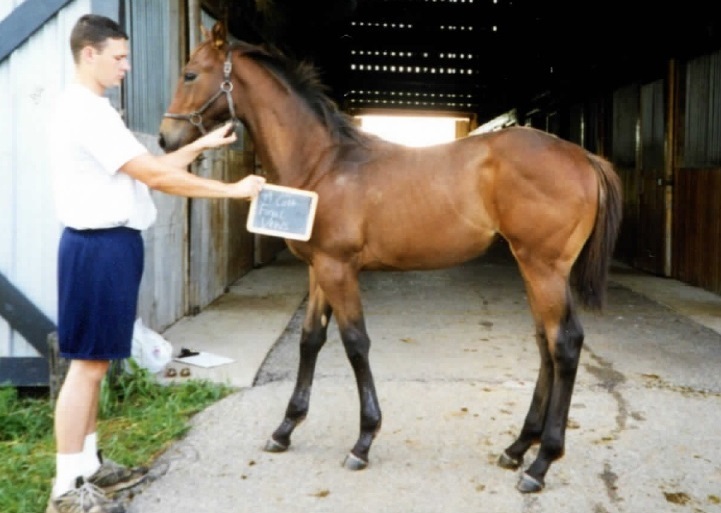 Derby’s dam, Final Vows, was a good producer, and among her progeny she foaled graded stakes winner Mighty Magee, Derby’s half brother. 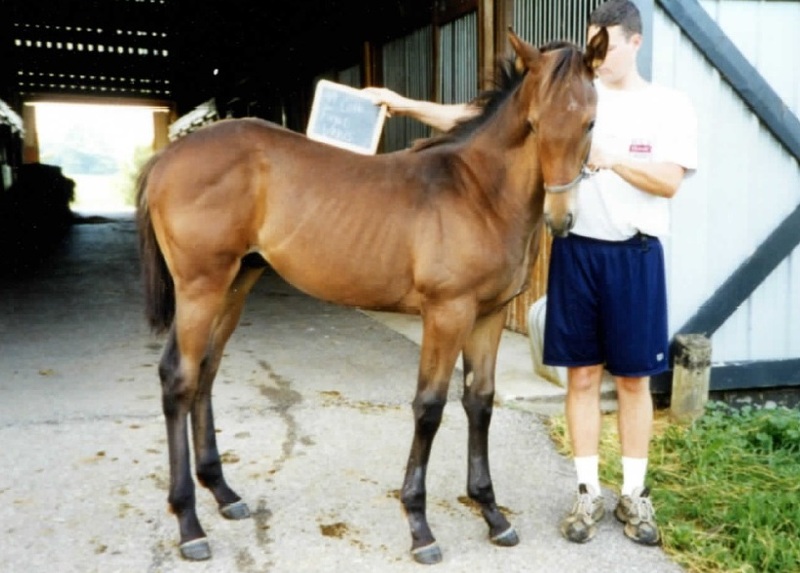 Her sire was Halo, who died in 2000 and was one of racing’s most prepotent sires, siring super-stallion, champion and classic winner Sunday Silence, Kentucky Derby winner Sunny’s Halo, champions Devil’s Bag and Glorious Song, and a slew of other top race horses including Jolie’s Halo, Lively One and Saint Ballado. Grandpappy Halo, evil but talented. It’s a good thing Halo was a good sire, because he was also a miserable creature with an evil temper and a reputation for savaging his handlers. Needless to say, Derby had his back turned when the genetics were being handed out – he didn’t inherit any of Halo’s brilliance, but he certainly didn’t get that temper, either. 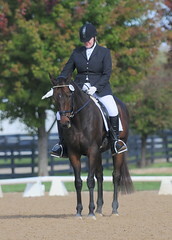 Generally speaking, Thoroughbred bloodlines mean little for dressage. 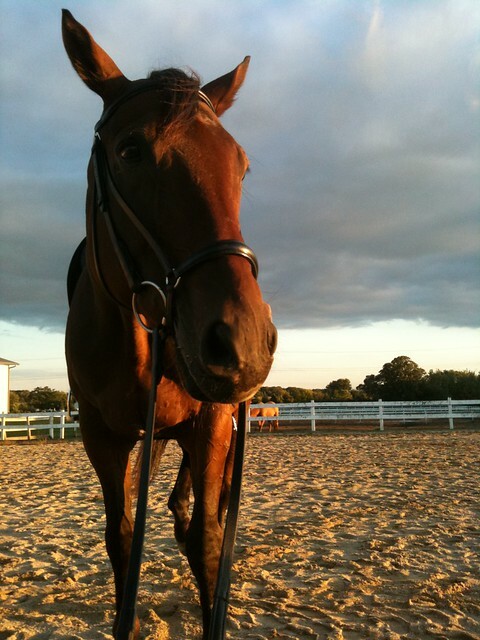 But to me, each Thoroughbred is a living piece of history. 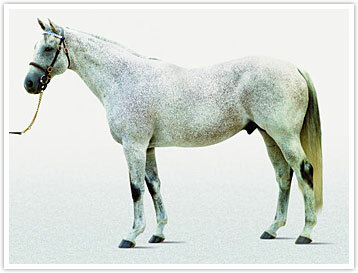 I followed Holy Bull’s triumphs avidly, and am well acquainted with Halo, his story and his progeny. It’s fun knowing my boy has these illustrious ties, even if it means nothing. The weather is getting crisp. 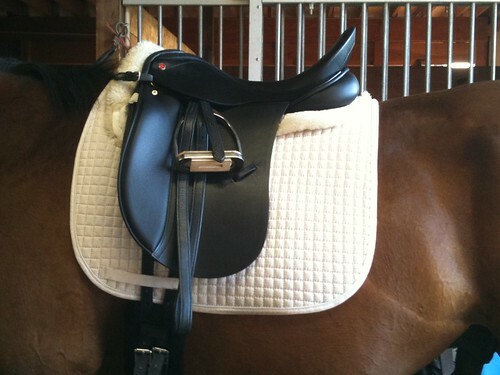 So were my canter transitions tonight. 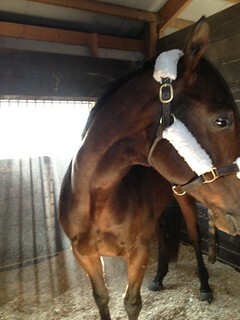 Derby was much more responsive, and I rode them a bit better too. 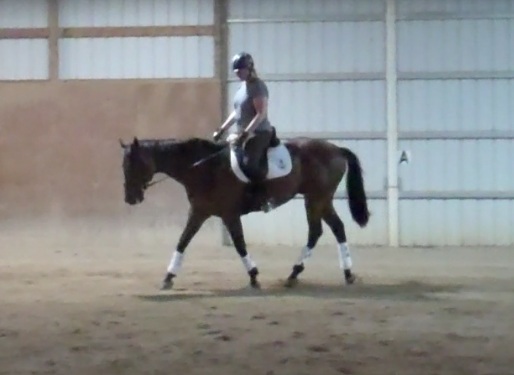 I didn’t do as many canter-trot-canter transitions as I wanted to – it was a busy night, but after a couple canters we had a pretty decent trot going. The connection is still lacking. I’m not sweating this at the moment. Right now, installing “forward” is key. Staying balanced and executing the transition with grace is still a challenge but it will become even easier as Derby becomes more responsive and steps into the canter when I ask him. Reducing the wishy-washiness of my aids will help greatly in this endeavor. Lesson tomorrow night. It’s going to be a little chiller, even. Here’s hoping for a report of even more crisp work tomorrow. Finally! I'm staying out of his way, and presto - the back comes up. Good boy! Stretchy trot is not a movement I’ve practiced much or ride well. 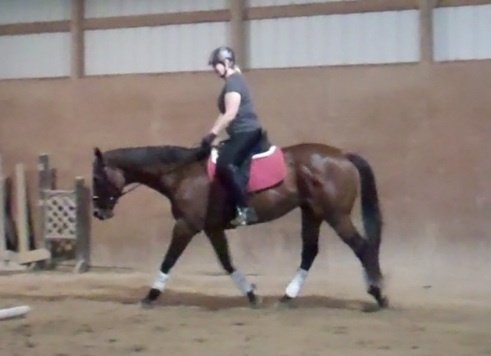 But as I’ve noted previously, I need to make a point of riding Derby over his back, and stretching into contact, in order to start building correct muscle, fitness, and his top line. I’m also trying to build my riding muscles back up and improve the independence of my hands. We focused on these issues in my lessons later this week. On Wednesday, Christy had me pick up from my earlier ride on Atlanta, and focus on moving the horse around with my seat, while also keeping my hands quiet. We had some nice moments but really, the ride was mostly about me trying to get my act together, and continue to figure out what makes Derbyhorse tick. She had me start by asking Derby to relax and give his neck at the walk. 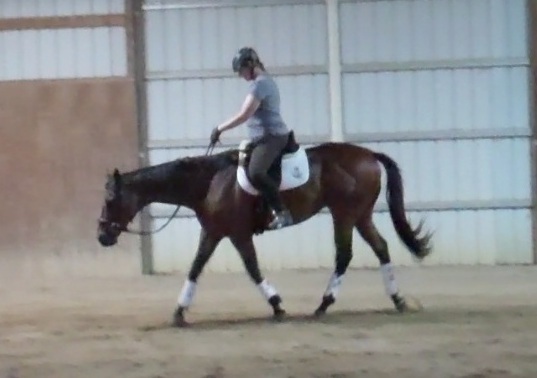 We then moved into some trot work, starting out on a loopy rein. I’ve discovered that I have to stay out of Derby’s face, and instead use my seat and leg aids – especially an active inside leg – to generate the results I want. Which is easier said than done for me at the moment. 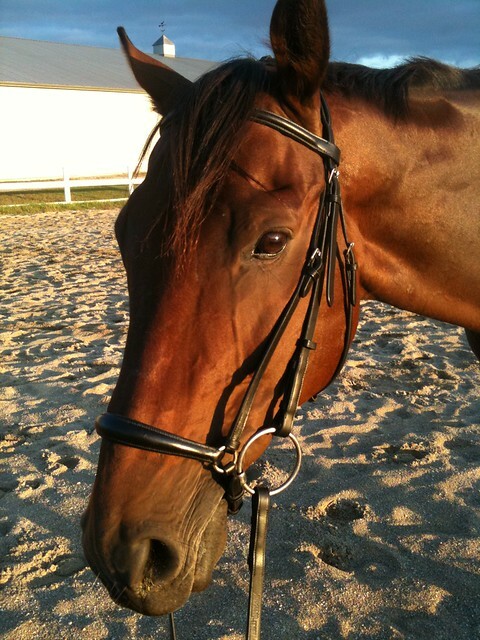 Tonight’s ride was better, chiefly because Christy had us do a new exercise that worked really well. 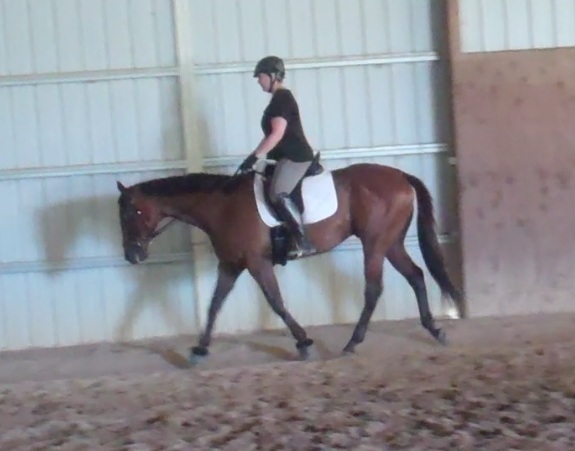 I started out trotting on a loopy rein, exaggerating the loop to keep my hands entirely out of the picture. 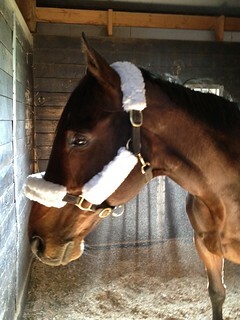 Derby stretches on a loopy rein. Derby stretched down, and stayed there. We motored around like that for a while, despite the fact that I was dumping him on his forehand. Christy had me gently shorten the reins a hair, and focus keeping my hands steady, telling me to think of my hands as side reins. She also had me close my fingers, reminding me that “There’s no way for you to give with open fingers,” while also telling me to let Derby find the end of the reins and invite him to hold the contact in his stretch. The good news is that we really got the hang of stretching, and eventually Derby brought his back up, seeking and holding the contact. 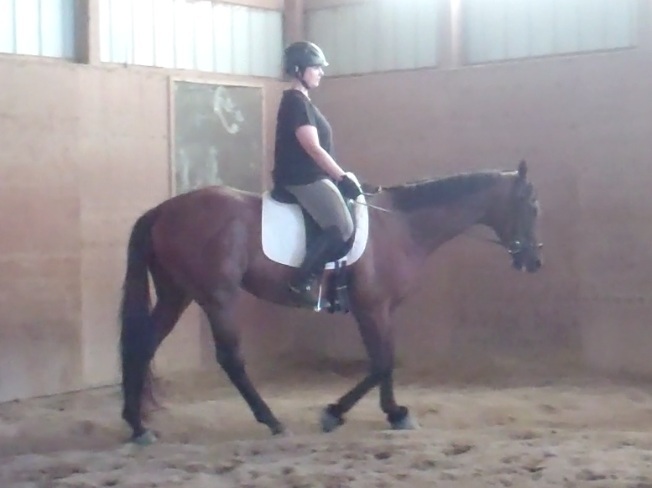 I’m really pleased, because after spending the last few months watching Christy patiently build Remy’s fitness, I know that a lot of steady trot work in a stretchy, connected frame is an important building block. 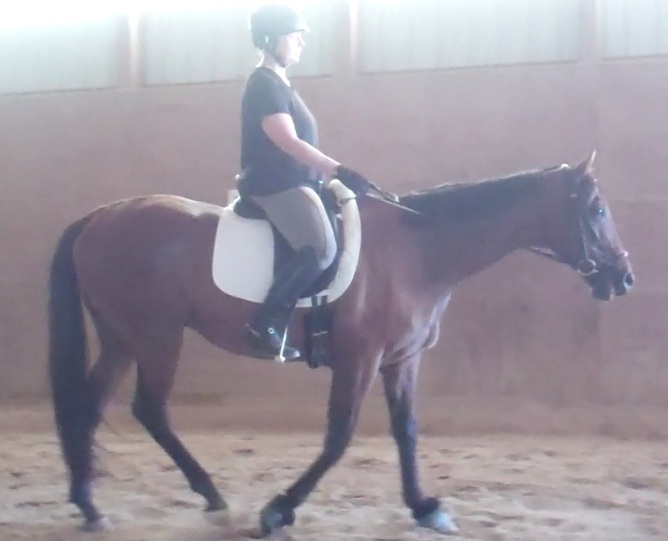 And, at training level, the stretchy trot carries a double coefficient – it’s an important test of the horse’s connection. Getting good at this is important, but I know I can do this on my own and that we’ll improve. Tonight was just the start.